Despite how it may look on the surface, The Wolf Among Us doesn't follow standard approach to morality in games exactly, but instead builds on the idea of options not being built on a binary system at all. Up until very recently, one of the ideas that was getting all the buzz in video games was the concept of offering "moral choices" to players. Games built around such offerings nearly always boiled down to whether you wanted to play a good, traditionally heroic character or one who was a bit of a prick. Those who tried to play as a character with some amount of complexity were summarily punished because the game system required the player to maximize one side or the other in order to get access to the best items, abilities, or what have you. In fact, most games boiled down to a single choice that the player was forced to make over and over. These weren't moral choices at all, but mathematical problems hidden behind a thin veil of fiction. 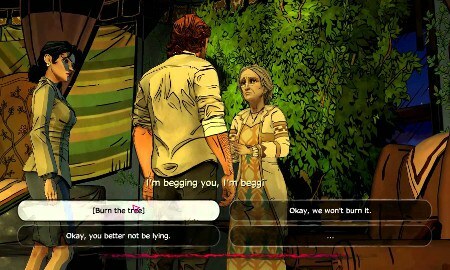 Telltale challenged this standard approach to morality in games with 2012's The Walking Dead by presenting the player every opportunity that it could muster two terrible options as the player's choice. Suddenly the player wasn't trying to maximize benefits for the sake of gameplay, but only to minimize harm. And even then, minimizing harm was a matter of opinion as different players found themselves with different priorities, such as which characters they cared most about and wanted to see harmed least. Despite how it may look on the surface, The Wolf Among Us doesn't follow this logic exactly, but instead builds on the idea of options not being built on a binary system at all. In the game, Bigby's choices usually boil down to a Mass Effect style paragon/renegade dichotomy. Each situation that he gets into is tainted by how much he is willing to leash or unleash his inner wolfish nature. The constant character choice highlighted by the game is whether or not Bigby gives into his baser impulses. The Wolf Among Us is a detective story, so when Bigby is not in a violent situation, this option is represented by a choice to follow procedure or to play by his own rules. And like The Walking Dead, The Wolf Among Us keeps track of your relationships with other characters. That can be an even greater influence on how a player chooses to proceed more than how they wish to behave within a vacuum. However, many of the choices have philosophical implications beyond one gruff detective's own behavior and how much other people like him. Parallel to the personal paragon/renegade dichotomy is one of order vs. chaos, law vs. anarchy. The system in the fables' community is horribly broken and corrupt. But because the system is broken does not mean that individuals themselves are tainted. While Bigby Wolf and Snow White may be complicit in the ill functioning home office as employees of it, they both still want what is best for the community above all else. The player's choices come in how they wish to remove the rot that has been allowed to fester. Snow represents a new order that is yet to be established in Fabletown. She wants to reform the system by burning away those undermining it and all the obstacles that these individuals have been erecting. She sees this as a legal matter. These people, the Tweedles, Ichabod Crane, Bloody Mary, and the Crooked Man, are criminals, and once they have been removed, the process of helping fables in need can begin in earnest. She wants to help those struggling on the bottom rungs of fables society, but any of her efforts are going to be hampered by the embezzlement, physical intimidation, and wage slavery that their enemies are oppressing the community with. Snow is correct that the Crooked Man and his organization does need to be dealt with as they are not only committing crimes in the name of their own greed, but actively causing the economic downturn that allowed them to gain a foothold in so many lives. Additionally, they are disrupting the political will and the ability to end the inequities in the system. The Crooked Man is presented as the boss of an organized crime outfit in the fables' world, but he has achieved a status where it would be more accurate to categorize him as being something quite like a corrupt bank or a proprietor of hedge funds. However, there are problems with only looking at the macro level of the situation. Bigby doesn't see things from such a vantage point. He is on the ground level, dealing with people directly and seeing their problems up close. He might not be able to see the larger implications and systems at play causing the pain, but at the same time, he can see the troubles that adhering to the law will cause. In Episode 3, "A Crooked Mile", Bigby and Snow confront a witch, Aunty Greenleaf in her home, asking her about black market glamours (illusion magic to make one look like someone else). Such magic is illegal if not received from the licensed witches from the 13th floor. However, such magic is hard to create and therefore very expensive. The expense is also inequitable, as those fables that can pass for humans don't need them, but all others have to if they wish to remain in Fabletown and not be shipped off to the farm. At the same time, these glamours don't just make you look human, but like another person. Arguably the magic being used violates the person who is being copied as it has in earlier episodes with Snow. And to further complicate the issue, this magic tree, by which she creates the glamours, is the Greenleaf's only source of livelihood. At the end of this confrontation, Snow tells Bigby to burn the tree. While Snow is strictly adhering to the law and would have been protected from the violation, she is missing the harm that it would cause. Up to this point, Snow has been the voice of law and order, and in doing so, she has appealed to Bigby's better, less primal nature. Here the circumstances have flipped. Snow is now ordering Bigby to commit an act of violence. Choosing to leave Greenleaf and her tree alone is framed as going against Snow even though it is arguably the more compassionate option. Additionally, the player can choose to split the difference and make this witch official by moving her and her tree to the 13th floor with all the other state approved magic users. This option makes neither woman happy. Aunty Greenleaf doesn't want to be a government stooge, but in the face of losing her tree, she reluctantly relents. Snow White hates that Bigby undermined her as it will make her job that much harder, but also because he let the witch off for breaking the law. Snow is just trying to take down Crane and his corrupted form of governance and trying to replace it with something better. She doesn't see letting criminals go or (even worse) rewarding them as doing that. Bigby's own view of the matter is in the player's hands. His options are informed by his micro view of the community. He can see the pain and hardship such an act will cause Greenleaf, yet he also knows Snow and trusts her higher minded thinking on the situation. This choice is one of the better ones offered in The Wolf Among Us. Through the options' framing, it reverses what are the expected actions for the paragon/renegade dichotomy. It also readily highlights the problem with an absolutist solution even in the face of a huge crisis through the clashing not of right and of wrong, but through macro and micro viewpoints of the circumstances. Furthermore, it ends up being a great character moment for everyone involved regardless of the choice made. The Wolf Among Us has been hard up for a lot of good choices throughout its episodes. It isn't a piece of survivalist fiction like The Walking Dead in which difficult moral quandaries are constantly coming up due to the game's context. It's a mystery, which means a lot of set up, a lot of investigation, and a lot of exposition. The difficult choices only come up when enough of the situation is understood. There are plenty of procedural character building moments, but it's the few moral choices that connect to the larger philosophical implications that really show what The Wolf Among Us is capable of. Sure, I would have liked even more choices like Aunty Greenleaf's tree, but the specific needs of the narrative would require a lot of time to set up moments like this one. The Walking Dead only needs to establish that we are now in a zombie apocalypse and that all the world's infrastructure, both mechanical and social, are crumbling. From there, the individual situations are informed only by immediate circumstances. Think about how much needs to be established for the player of The Wolf Among Us for this choice about the tree to have any weight. The player needs to know what a glamour is, why glamours are important, why they need to be regulated, the further implications of black market magic, who is using them and for what purposes. And that's just to know why the tree is a contentious object -- let alone understanding what a precarious economic situation that Aunty Greenleaf is currently in or the state of the government that would drive her away in the first place or Snow's own philosophical affinities or how that ideology would affect the larger community should she come to become that community's new authority figure. And that doesn't get into Bigby himself. It requires a lot of work to set up such a deep and debatable choice as this one. But then of course it would. Hard choices are hard because they are complicated by many competing views and needs that can't have everyone coming away with something. It's why so many games that highlight their moral choice systems end up forcing such simplistic choices and often redundant ones at that. They want a system which feeds back into gameplay itself. Unfortunately that leaves little to no time to set up the complexity necessary to really challenge the player with the circumstances presented to them.